A GOAL with the last kick of the ball gave Brechin City an undeserved win over Dumbarton at Glebe Park. A GOAL with the last kick of the ball gave Brechin City an undeserved win over Dumbarton in front of a 412-strong crowd at Glebe Park. There was a busy start from Sons, as they pressed forward determinedly in the opening exchanges. On 15 minutes a Ross Forbes free-kick was deflected into the path of Ryan Thomson. He brought out a smart save from goalkeeper Patrick O'Neil, but the rebound was put over the bar by Stuart Carswell. While neither side exerted dominance in the first half, the majority of chances went to Dumbarton. The visitors continued to press after the break, securing a succession of corners, but without a breakthrough. Sons were down to ten men just short of the hour, when Michael Paton was sent off for a second bookable offence. The appalling Brechin floodlights did not deter the men from the Rock, however. On 68 minutes O'Neil was forced to pull off a superb low save to deny Andy Dowie's flying header. But it was heartbreak for Dumbarton in time added on, as Jordan Tapping squeezed the ball in following a corner with literally the final kick of the match. 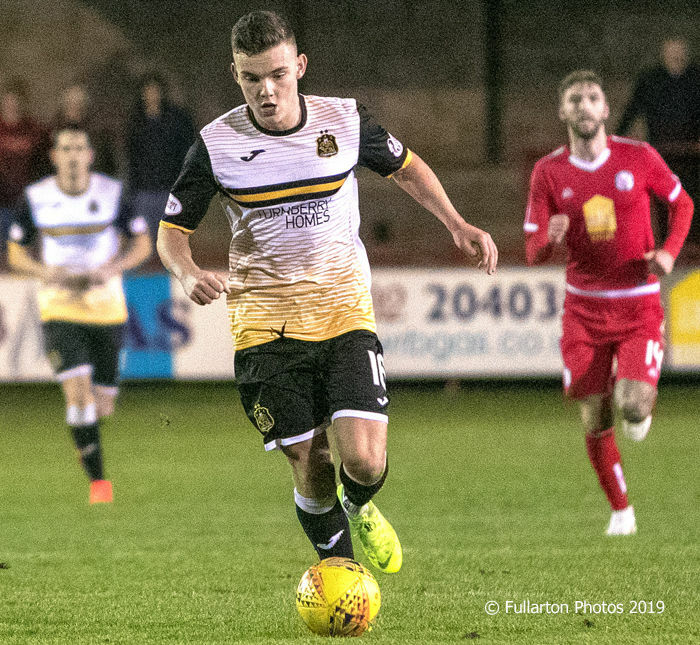 The only consolation for the travelling support was a fine debut by 20 year-old Ben Armour (pictured), signed from Morton on a development loan the previous day.